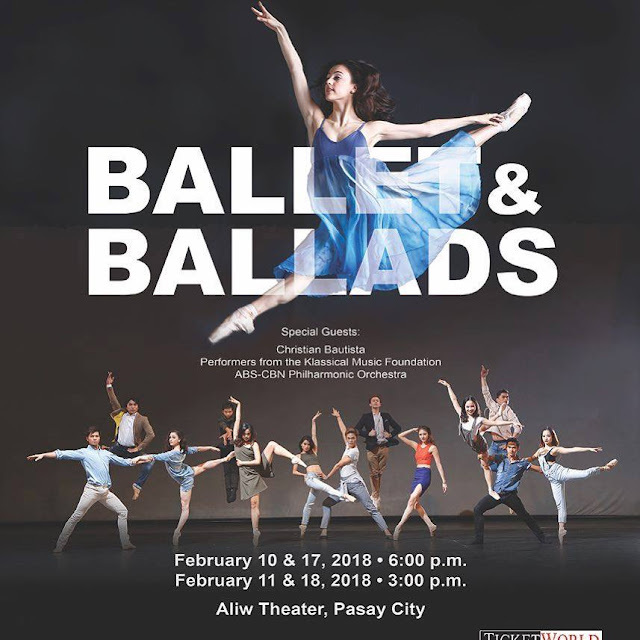 Life News: Check Out Ballet Manila's “Ballet & Ballads”! A tradition in almost all of Ballet Manila’s performance seasons, Ballet & Ballads, once again returns to the stage to bring music and lyrics to life. And in an effort to bring ballet to the people and the people to the ballet, the country’s premier classical dance company plans to close its current season with a star-studded affair. The ABS-CBN Philharmonic Orchestra, no less, will serenade the audience during the entire night. The acclaimed group has also prepared a very special Teleserye suitefeaturing a selection of classic hits from the ABS-CBN primetime repertoire. The show will surely trigger some nostalgia, especially among fans of Filipino pop culture. The newest installment of “Ballet & Ballads” will premiere on February 10, 2018 at 6:00PM at the Aliw Theater. There will be three other shows: February 11, (3:00PM), February 17 (6:00PM), and February 18 (3:00PM). For more information about the shows, including ticket prices and schedules, you may visit www.balletmanila.com.ph or follow Ballet Manila on Facebook, Twitter, and Instagram. Tickets are also available through all TicketWorld outlets. Please call 891-9999 or visit www.ticketworld.com.ph for more information. In addition, those who are planning to watch all the shows may take advantage of the company’s Season Subscription Programs, which offer up to 50% discount on ticket prices. For more information, you may visit www.ticketworld.com.ph/balletmanila/Online and click on ‘View Details’ under ‘Season Subscription Program’. Life News: Canon's Pixma G Series Is Here!